We all do it… we write random notes on pieces of paper that get lost on our desks, in the wash, or even in the trash. Capturing this information in the new Act! Scratchpad can eliminate the hassle of entering our notes into Act!, organizing them, and finding them when we need them. We can quickly capture impromptu notes, phone numbers, and personal reminders with or without opening Act!. When we use the Scratchpad we get a convenient, virtual notepad. In this tip, we’ll learn how to make the most of this new tool. Capturing Notes/Activities/History and Sending Them to Act! When we have random tasks, notes, or other information which interrupt our work, we can quickly capture them with the Act! Scratchpad, then deal with them later by recording them in Act! or deleting them from the list. Go to Tools → Act! Scratchpad. Or, click on Start → All Programs → Act! (or Act! Premium) → Act! Scratchpad. Or, double-click the Scratchpad shortcut on the desktop. Click anywhere in the list to add a new entry. 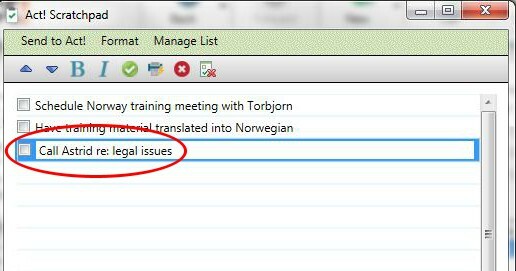 For example, we can type Call Astrid re: legal issues. 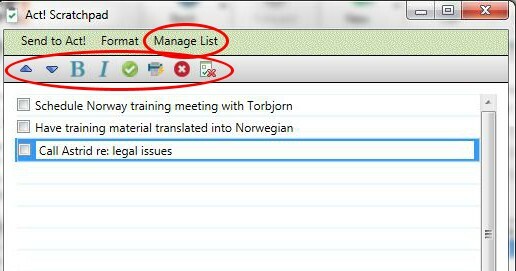 Use the toolbar or the Manage List menu to reorder, format, mark complete, or delete list items, or to clear or print the list. You can also drag and drop the list items to reorder them. 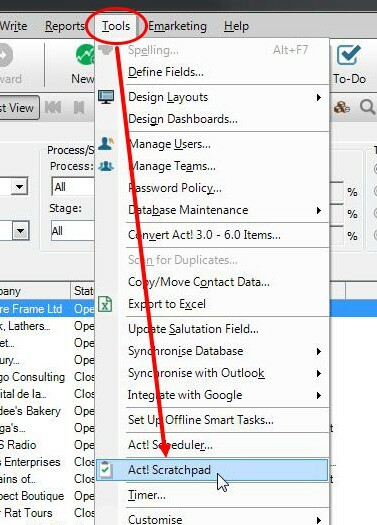 Right click the item, or select the Send to Act! Menu. Complete the appropriate information (such as time, date, and Contact with which to associate the Activity/History or Note). 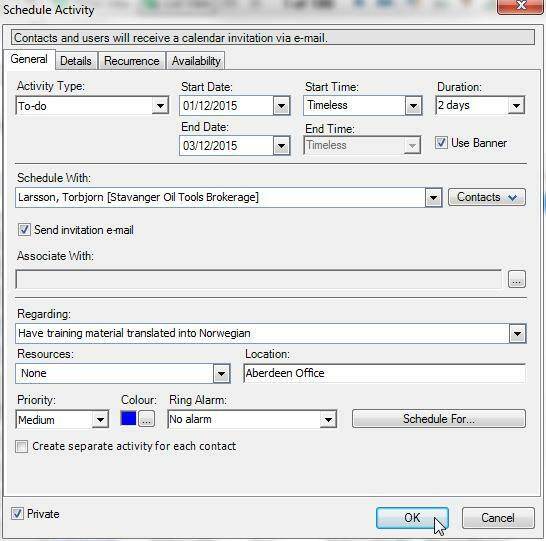 In the example, I am scheduling a To-Do activity. Click OK. The selected item will be added to Act!. As you can see, using the Scratchpad is easy. We can forget all about sticky notes. Jot your notes down on your computer instead, and then use Act! to organise them when you have time to sort out the details.